We are pleased to offer on behalf of one of our clients this beautiful and well kept Datsun 240Z. 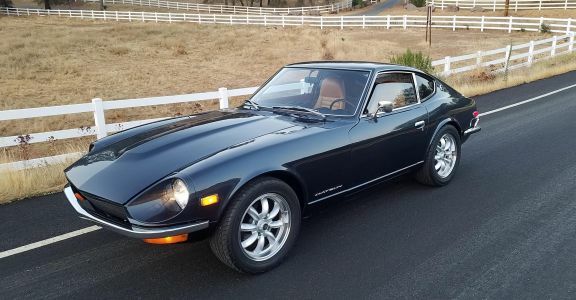 Seeking to compete head-to-head with established European sports cars, Datsun priced the new 240Z within $200 of the British MGB-GT in the United States, a five year-old design that showed its age. The 240Z's sleek styling, modern engineering, relatively low price, and impressive performance struck a major chord with the public. Positive response from both buyers and the motoring press was immediate, and dealers soon had long waiting lists for the "Z". As a "halo" car, the 240Z broadened the acceptance of Japanese car-makers beyond their econobox image. Datsun's growing dealer network compared to limited production imported sports cars manufactured by Jaguar, BMW, Porsche, Alfa Romeo, and Fiat ensured both easy purchase and ready maintenance. All variants of the S30 have a four-wheel independent suspension consisting of MacPherson struts in front (borrowed from the Nissan Laurel C30) and Chapman struts in back. Front disc brakes and rear drums were standard. This car has been sold new in August of 1972 to a Lady in the California Bay area who kept this car for the next 30 years until 2002. We have the original bill of sale, the window sticker and dozens and dozens of invoices and documents which nicely tracked the history of this Japanese sports car. The car is largely un-restored but has been color-changed from green to blue metallic a few years ago. It runs and drives very well and still carries its correct numbers matching engine. Aside from the larger 8x16 rims the car is very original and un-modified. A great daily driver! The car comes with all original books and manuals, tools and spare tire. Japans legendary Z car now on a clear path to become a collectable. Strong potential for higher prices in the forecast.